The World Endometriosis Research Foundation estimates 1 out of every 10 women over the age of 15, or 176 million women worldwide, suffers from endometriosis. Endometriosis is a painful and debilitating disease affecting women of reproductive age (i.e., puberty to menopause). Endometriosis is one of the most common gynecological disorders that can affect women. 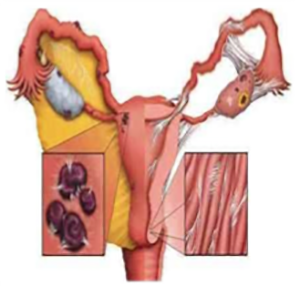 It is a disorder in which abnormal growths of endometrial-like tissue are present in locations other than the uterine lining. It can occur in various pelvic sites and in distant sites. Endometrial tissue outside the uterus responds to changes in hormones. Beginning at puberty, this inflamed tissue breaks down and bleeds during the menstrual cycle causing scar tissue, called adhesions. Adhesions can bind organs and cause acute pain. Endometriosis is typically diagnosed after more than nine years of disease progression. The results include debilitating chronic pelvic pain, severe PMS, number one cause of infertility. Endometriosis is typically diagnosed after more than nine years of disease progression. These nine years of disease progression can not be reversed. Diagnostic to predict the patient’s likelihood/predisposition of developing the disease. A safe and effective long term therapeutic that can arrest the progression of the disease or prevent its origination all together. NHP-07 – First pharmaceutical/therapeutic candidate to be developed by PRx. Management believes NHP-07 with EndoRisk® as a companion diagnostic/prognostic is the only treatment protocol that can prevent development of endometriosis and, in women experiencing advanced stages of endometriosis NHP-07, stop the progression of the disease while suppressing the debilitating symptoms.